Whilst creative brilliance is often achieved through a considered and practiced dedication to an art form there are few gains without risk, and this is one of the hardest things of the fledgling artist to come to terms with. The painter Francis Bacon (1909-1992) used to throw paint randomly at a near completed painting as a matter of course. 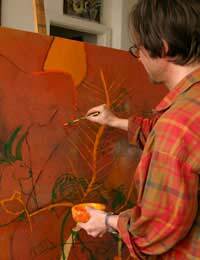 From the resulting mess he would then eke out a new form for the painting. The result was often a painting that reflected in its final appearance the risk taken during its creation – dynamic works that express the uncertainty of life. Other than this kind of direct risk taking, there are moments when sure decisions must be put aside in favour of delving into the unknown. This may mean trying a new medium or making a brave statement within your work that could leave yourself in the position of justifying your actions. To take some kind of risk in order to develop your artwork is often difficult as flies in the face of how creativity is often perceived. Creation is often seen as something achieved through gentle and gradual building along logical lines. Creation is achieved through pursuing a sequence that can be logically expected to end with a perceived final result. However, as creativity implies the production of something new, it is not always of benefit to have a clear idea of an end result in mind. As the philosopher and cultural theorist Gilles Deleuze (1925-1995) argued no new artwork is made by imposing upon it a solid final judgment in advance of its creation: judgment must be deferred until its completion! Thus, risk taking need not be seen as a destructive element that is opposed to creativity (as is often the case), but can rather be seen as an element that opens up new possibilities and stops prior judgments being made about a works outcome. In this sense Risk can be seen as part of the wider process of art-making that can be incorporated within a wider structure. For example, a set of processes can be followed, but chance occurrences during the artworks development can be built upon and incorporated within the structural exercise in order that you may discover new forms and effects. It is not possible to really set out in an exercise how risk or chance might best be employed in an artwork – that would be to remove the risk altogether! The main thing is to adopt the attitude that when making a good artwork, not everything can or should be planned for in advance. This is something hard to get one’s head around, but once you start putting this attitude into practice you will soon reap the rewards! If in doubt simply look to the works of great painters like Titian (1485-1576) and Goya (1746-1828). Taking a cursory glance at the works of these masters it is hard to see how every single mark could possibly have been planned in advance. Often the most exciting areas of a painting appear to have come about by chance.